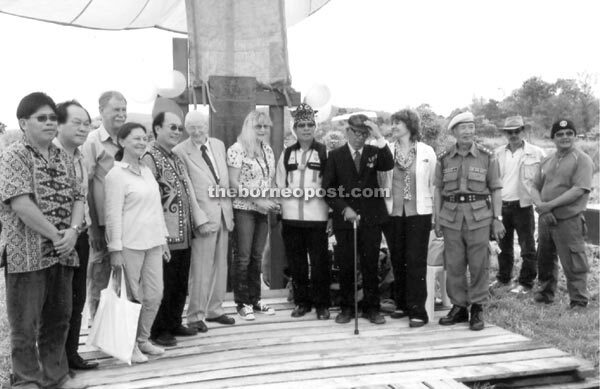 A 2013 file photo showing members of Rurum Kelabit Sarawak together with Jack Tredrea (sixth from left) at the unveiling of the Bario Commandos Parachute Landing (1945) Memorial Wooden Plaque in Bario. KUCHING: This year, more precisely March 25th, marks the 70th anniversary of the landing of Allied Forces in Bario in the Kelabit Highlands. To commemorate this historical occasion, a special ceremony will be held in Bario. It will be attended by the only remaining member of the Z Special Unit, Commando Jack Tredrea, and families of the local Kelabit heroes who worked alongside the unit. Tredrea, who is now 95 years old, will attend the ceremony with his daughter. Also attending the event will be David Sanderson, the son of CF Sanderson and Judith Heimann, author of ‘The Airmen and the Headhunters’. This landmark ceremony is organised by the Rurum Kelabit Sarawak with the assistance of Sarawak Tourism Federation Heritage Development Committee who designed and created the commemorative plaques. According to Rurum Kelabit Sarawak president Dato Isaac Lugun, the ceremony will be a memorable event held in remembrance of the brave soldiers and those who helped them. “This will also be a significant event with the presence of all those who participated in the events following the arrival of the Unit. As many of those who were initially involved are not around anymore, their descendants will take their place,” he said. Isaac also mentioned that the arrival of the Allied Forces in Bario and the participation of the Kelabit people in the fight for peace had a significant impact on the Kelabits. Citing Tom Harrisson’s book, ‘World Within’, he said that while some of the local operatives were decorated for their war services, many were not. “Kelabit leaders such as Penghulu Lawai and Penghulu Miri were instrumental in the war effort and rightly, they were honoured,” he said. The 70th Anniversary memorial service is important as it acts as a historical touchstone. “It links the past to the present and enable people to remember and respect the sacrifice of those who fought, participated and those who gave up their lives in the conflict,” he added. It was said that on one cold, misty morning on March 25 in 1945, a Liberator flew over the tiny settlement of Bario in the Kelabit Highlands. Out of the hatch of the Liberator, shot out four young men clinging to parachutes and landed on the Plain of Bah. A little while later, another Liberator circled the plateau and four more parachutes descended from the air. These eight brave, young British and Australian men were members of the voluntary Z Special Unit and their mission was codenamed Semut 1. The ‘Ants’ as they were called were Major Tom Harrisson, Sergeant CF Sanderson, D H Bower and J K Barne. In the second aircraft were Harrison’s Lieutenant EA Edmeades, Warrant Officer RD Cusack and Sergeant KW Hallam and Staff Sergeant H J Tredrea. Their mission was to establish initial contact with the indigenous people of Borneo and to train and deploy them as guerrilla troops against the Japanese forces. This marked a significant chapter in fight for freedom and for peace in Sarawak and the liberation of the island of Borneo from the Japanese.